The fourth Simon Serrailler novel looks at death from a wide range of perspectives: natural, unnatural; past and present; of old characters and new ones. By the end of it, I felt I had gone through the wringer, but as usual with this author, the journey was worth it. 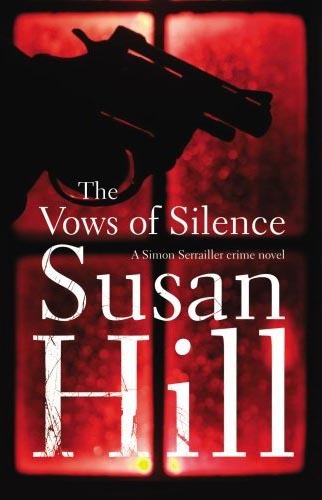 THE VOWS OF SILENCE follows the formula of previous books in the series, switching between a police-procedural plot and the domestic lives of Simon, his extended family, and assorted residents of Lafferton. The crime part of the plot is here provided by an executioner-style killer; a loner who when young displayed obsessional tendencies, eventually fixating on a young woman called Alison. When Alison jilts him for his best friend, our "villain" goes insane, taking to wearing combat trousers, hunting and shooting game, living alone and generally fitting the profile of many an unhinged murderer. He stalks young women about the town and shoots them in a variety of "clean" ways, leaving Simon and his colleagues stymied by the apparent absence of a pattern to the killings. Each death is described in Susan Hill's characteristically brisk, unsentimental yet moving style: a woman who has just married and is awaiting her husband's return from work; a single mother worn-out by her young baby; two girls out for a pub night. Simon, always a distant person, is even more so in THE VOWS OF SILENCE. He is reduced to the role of observer as his sister Cat Deerbon has her own tragedy of biology to cope with. Another regular character, Karin, is a sad focus near the start of the book, her predicament leading to the return of Jane, Simon's potential (but never realised) love-interest from THE RISK OF DARKNESS, the previous novel in the series. Another theme of death occurs in the story of Helen, a local woman whose husband Peter has died of cancer, leaving Helen to bring up her two children, now teenagers. After years of widowhood, Helen joins an Internet dating agency and begins to see Phil, a history teacher, much to the delight of her daughter Lizzie but to the consternation of her son Tom, a committed Christian, as Phil is an atheist. As Helen struggles to reconcile her warring internal loyalties to her old family and her desire to start again, we also see how Richard, Simon's father, is trying to start a new life - despite Simon's hostility to these new domestic arrangements. The author switches between characters and themes with assurance and skill, making the reader eager to find out more, particularly about the frustratingly remote character of Simon. The awful effects of disease, both on individual people and their families, are contrasted with the shooter and his clean "mercy" kills. Without giving too much away, Simon does eventually solve the case, in a slightly unsatisfactory flash of insight, and in a bit of a cheat of a solution (depending on information being deliberately withheld from the reader). The strongest parts of the book are the passages about family and other interpersonal relationships, although the Simon-Jane "will they won't they" subplot is almost impossibly drawn-out, in fact so laid-back that it is in danger of vanishing into invisibility. Let's hope for some fireworks in the next volume, to bring this intriguing character-sketch of a detective more sharply into focus. In the meantime, full marks to Susan Hill for her ability to face the unfaceable and show us many facets of the devastation that biology can wreak.